Mobile Money Asia: Contactless Payments in Emerging Markets: Can Mobile Leap Frog Developed Markets Once Again? Contactless Payments in Emerging Markets: Can Mobile Leap Frog Developed Markets Once Again? Much has been made of the disappointing growth in mobile contactless payments and near field communication in developed markets. Issues such as sunk cost in existing point of sale infrastructure, business models between operators and banks, and the maturity of handsets and embedded near field communication (NFC) chipsets have presented challenges that have yet to be completely overcome. Contactless cards themselves have struggled to gain huge traction, primarily due to the lack of acceptance in developed markets, and industry players have been slow to look at using phones as contactless acceptance points. Initiatives such as Isis and Google Wallet in the United States, and bridging solutions for mobile contactless including secure micro SD card have provided some solutions for pilots and trials, but it would be fair to say there has not yet been a significant commercial success in mobile contactless in a developed market (with the exception of Japan, and to a lesser extent Korea). Which makes the announcement of Apple’s Passbook in iOS6 all the more fascinating, but that is a blog for another day. The subject of this muse is the fascinating developments that we are seeing in NFC in mobile payments in developing markets, and my hypothesis is that they could be successful in reducing the some of the friction in mobile money, and potentially leap frog what we have seen in developed markets. Digicel Pacific’s launch of a mobile contactless solution in Tonga effectively removes the friction that customers have in making payments at merchants, whilst Google’s Beba card and contactless solution for transit in Kenya simplifies the customer acquisition process by removing the need for a phone at all in order to make transit payments, and leap frogs the point of sale acceptance barrier by using Google Android mobile phones as card readers and acceptance points. One of the difficulties and indeed, a major inhibitor in growth in mobile money is the clunky process of paying for goods or services at a merchant. The process of having to open a mobile session and then enter merchant or agent identification or phone numbers, and PIN codes either side of the transaction, makes the entire process easily over 60 seconds. This is frankly too long to be attractive to either the consumer or the merchant, and the friction of the experience leads people to pay by cash rather than mobile. Digicel Pacific in conjunction with Verifone recently launched a mobile contactless solution in Tonga where international remittances provided through KlickEx can be cashed out, and merchant payments made through the use of contactless stickers, and low-cost POS devices. The source of funds is the Digicel Mobile Money account. This video provides a demonstration of the transaction, and clearly shows the lack of friction at the merchant location. Whilst the economics of investment in POS devices versus increased transaction volume aren’t available, the mobile money team at Digicel should be recognised for piloting an improved process for acceptance in mobile money. 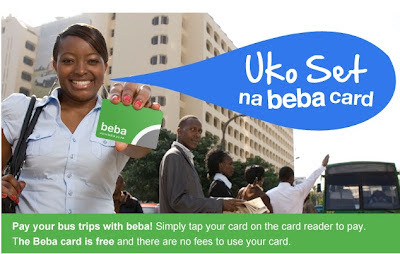 The launch of Beba in Kenya by Google has been a fascinating development for mobile money. The very simple transit system works like this. A customer goes to an agent in Nairobi and is given a free contactless card. The customer does need to have a Gmail account in order to be registered. That card is then loaded with a maximum of KSH10,000 (US$115). Customers can reload as they need to at the agents throughout the city. When a customer gets onto a bus the card is waved in front of the drivers Android phone with NFC reader and the card is debited the fare. They are not charged a transaction fee for the service. The customer then receives a SMS receipt with the cost of the fare and their account balance. The solution solves a particularly difficult problem for customers in that bus drivers are known to hike the fares when there was inclement weather or heavy traffic (seriously, has anyone ever seen Nairobi WITHOUT heavy traffic! ), so the solution appears to address a problem in the market. Interestingly, Google is using Top Image to merchandise the solution and develop the agent network, the same firm that has been critical to the success of M-Pesa. What I really like about the Google Beba solution is that it has taken out two major friction points for mobile contactless payments in developed or developing markets – firstly, the customer’s phone, and secondly, contactless readers at the point of sale. The simple fact is that not all customers will own a phone that is mature enough to have either an embedded NFC chip, or be able to utilise a bridging technology such as Micro SD cards. By issuing a low cost contactless card, and relying only on the NFC-enabled phone of the bus driver, Google appears to have addressed a market need, ensured that any potential transit passenger can be activated, and by partnering with Top Image is potentially developing an agent network that can support the ecosystem. In addition, by only using the driver’s phone for acceptance, Google has removed the need to invest in expensive point of sale infrastructure and card readers, and instead uses a relatively low cost Android handset. This is a great initiative, and it is not hard to surmise that we would have seen far greater issuance and usage of contactless cards in developed markets if the cost of acceptance could be driven down by such an approach. What is unclear in Kenya is the revenue model for Google, although this initiative could certainly be a bridgehead for the company in developing payment solutions for emerging markets, which should send a shudder through existing mobile money providers and payment schemes. Mobile contactless and NFC technology present a compelling proposition to issuers, merchants and customers alike to increase the speed of transaction, enable value added services such as loyalty and offers to be provided, and continues to place the mobile phone at the centre of the customer experience. Whilst traction has been slow in developed markets, are we seeing once again the ‘leap frog’ effect of technology in emerging markets? I am sure all of us in the industry will watch the developments in Tonga, Kenya, and other markets with great interest. Thanks also to ex-Visa mobile contactless and NFC expert, Craig Richman for his review of the draft and feedback on this blog post. Great topic Brad. A very interesting move by the Google Emerging Markets Team. In unbanked markets a big issue for a payments business is how to drive liquidity into the system. A reoccurring payment like transport is simple proposition to get consumers to first regularly reload and use the service, and then look at extending acceptance to retail shops. I lived in Hong Kong a few years back and paid for my train, Starbuck's coffee and 7-Eleven munchie emergencies all on Octopus's prepaid card. They even had a successful loyalty program...sort of sounds familiar to the Google Wallet strategy. For a while I've been scratching my head wondering how NFC in a phone is superior to existing PayPass or PayWave contactless cards. It may take off when the integration of the payment and the apps on the phone bring new benefits to consumers (loyalty points, discounts, shopping recommendations, etc), but there is still no unique benefit over phone vs card in this case. What Google is doing with Beba is, I think, brilliant. The customers don't really need the smarts of having their phone and payment chip linked. The merchants, however, do need intelligence about their payments, and this turns a simple low-cost Android phone into a mobile, internet-connected, GPS-enabled POS terminal. They have turned the supposed benefit of NFC on its head by focusing on the merchant proposition, and I think it will lead to many more opportunities. NFC has not been a topic I have considered a priority for emergin markets. The investments seem to be to high. Beba clearly is a possible low cost solution and makes me think of Mongolia, the only place where NFC appears to be an issue. It would be interesting to better understand the business model and if this would work also within the context of markets which do not (yet) have such a viral mobile payment environment. How transferable to other markets is this? Intriguing to explore further. Hi Margarete, thanks for your comment. I would agree with you on the business model. What is working in Kenya is the fact that phones are only on the merchant side, which reduces complexity and cost hugely. Whilst cards are not the long-term solution in these markets, it is interesting how they are effectively using them as a bridging solution for mobile in the medium term. I think your point is very interesting though - could contactless be the tipping point factor in some markets? Certainly worth more investigation. Great post, Brad. First, spot on regarding Nairobi traffic -- it's just as you remember it. Second, I disagree regarding the 60 second delay as a barrier to adoption, mostly because it mirrors the cash-in/cash-out experience. Consumers expect to initiate a transaction and wait for the merchant to receive confirmation before receiving their own confirmation and completing the transaction. And this process almost always takes ~ 60 seconds. We've seen steady increases in M-Pesa payments at the point of sale across our merchant network. The barrier to adoption appears to be, not system delays, but consumer awareness -- less than 100 businesses throughout Kenya formally accept M-Pesa at the point of sale. My two cents. Keep the posts coming! Hi Ben, thanks for taking an interest! Your point on merchant payment is very interesting. I would be very interested to understand the commercial model M-Pesa are using for merchant payments now if you get a chance. Great post, a very informative post. Hi, Nice article about payments. Your effort for posting such is really appreciable. Thanks for stuffing this. Just returned from Nairobi, it seams lot of problems for Beba card there. NFC is not prepared for emerging markets. You will often have internet issues and Beba card will not work. Passengers need to use cash then. Best system still in these countries is the use of SMS tickets. I found www.mticket.co have the unique solution for places where smartphones are not available to the population that take public transport. Interesting feedback on Beba. Google has also just launched Beba in the Philippines but not sure how it is going at this stage. Thanks for reading the blog. Vodafone - one of the best networks in the country vodafone is one of the top network providers in the country. The customer base of this telecom company is huge and it grows everyday.